Bureau of Indian Standards (BIS), a statutory body under Ministry of Consumer Affairs, Food and Public Distribution, Govt. 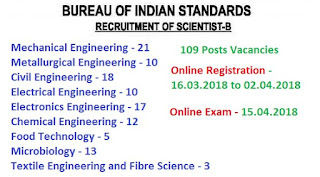 of India, BIS offers excellent career opportunities to bright, young dynamic persons for the post of Scientist-‘B’, invites applications from following subjects. Mechanical Engineering, Metallurgical Engineering, Civil Engineering, Electrical Engineering, Electronics Engineering, Chemical Engineering, Food Technology, Textile Engineering & Fibre Science Microbiology Graduates. Master’s Degree or equivalent with not less than 60% marks in aggregate (50% for SC/ST candidates). 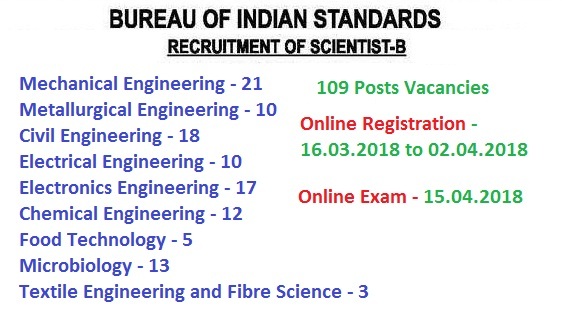 The candidates must be between 21-30 years of age as on 01.03.2018.